It was really lovely yesterday for a lot of the day, decently warm, sunny, gentle breezes and perfect weather for the start of the damsel and dragonfly season. 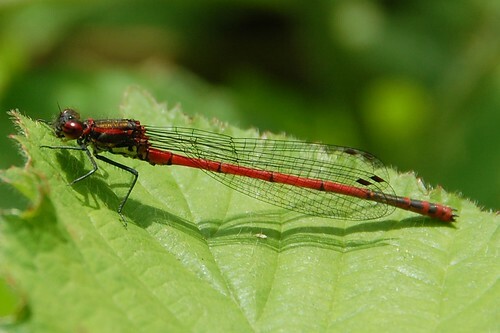 The large red damselfly above is only large in comparison to the other smaller red damselfly species but beautiful in its jewelled perfection anyway. I saw other green and blue damsels on the wing, locked in loving embrace (or just mating if you prefer not to be so anthropomorphic) and some beautiful demoiselles. There was also a female Broad bodied Chaser, a true dragonfly which I've photographed specimens of before but she wouldn't stop for anyone. 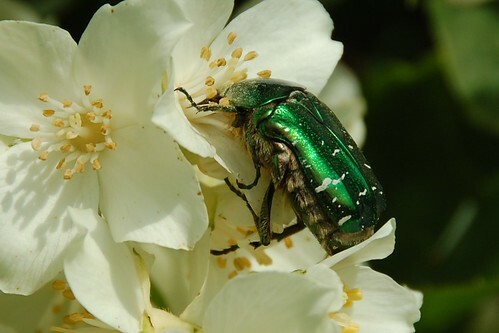 The green shininess of the Rose Chafer catches my attention every time I see one, a big almost scary beetle that feeds on pollen and has such lovely colours. Later in the day a huge cloud front rolled up from the south. We had been on warning for severe thunderstorms in the area and this was our share. An unusually eerie experience, the thunder didn't come in discrete peals but was a continuous rumbling murmur like huge rocks rolling down a mountain side and the lightning which could just about be seen although the sun had not set was flickering from cloud to cloud apparently never reaching as far as the ground. This went on for about an hour until finally there was a very heavy rain fall and storm passed over. Now we seem set for ten days of intermittent rain and very little sunshine. There are blight warnings out too so I'll have to pick a day for spraying the potatoes. I hope this isn't going to turn into another year like the last one.